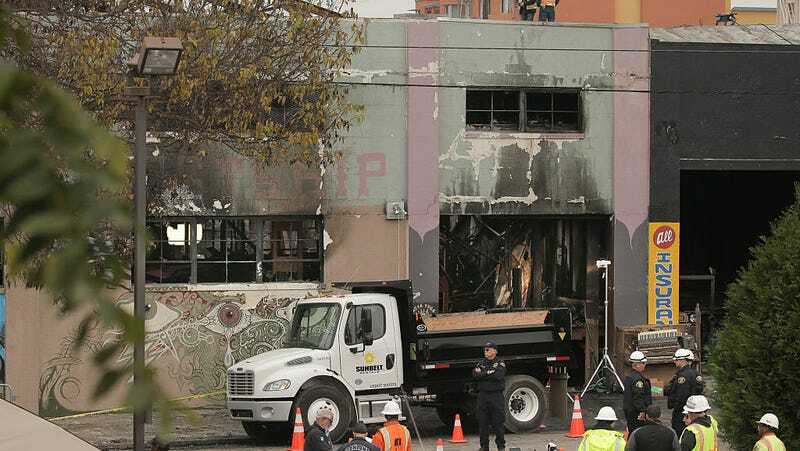 Leaseholder Derick Almena and supervisor Max Harris of the Oakland music venue and residence Ghost Ship, which caught on fire during a party in December, were arrested and each charged with 36 counts of involuntary manslaughter on Monday. According to court documents obtained by the New York Times, Almena filled the space with “fence boards, shingles, window frames, wooden sculptures, tapestries, pianos, organs,” and all of these items accelerated the fire. The documents say Harris, while preparing for the event, blocked off a second stairwell, which kept attendees from escaping. Both men face up to 39 years in prison. The party was also operating without a permit from the city and had not been inspected in 30 years, according to CNN. Thirty-six people died in the fire including the musicians Cherushii (Chelsea Faith Dolan), Joey Casio, Cash Askew, and Nackt (Johnny Igaz).